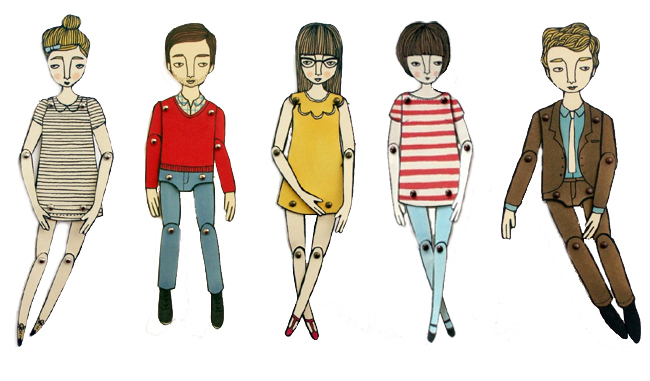 Today I am lusting after these paper dolls from 'Hollandsworth' - the work of Jordan Grace Owens. It's almost as if someone went to the trendiest bar on Old Street, waved a magic wand (a handmade, one of a kind magic wand, natrually) and turned all the coolest kids in the town into quirky, articulaed and fabulously styled paper dolls! I can just picture one of these dolls pinned amongst a cluster of framed prints, or propped up on a display shelf. Perfect! Like what you see? Then make sure you check out the Hollandsworth etsy shop for more adorable items such as magnets, pins, prints and t-shirts. Love these dolls too. Ok I'd go check their site.